Hello! Hope you are having a great holiday time. I'm at my parent's house and I woke up to a very nice surprise. 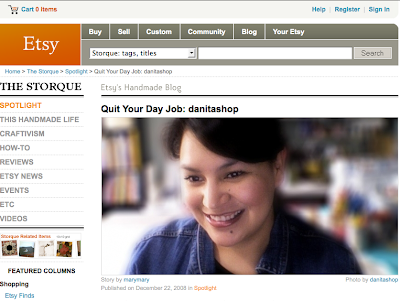 I was interviewed by Etsy's MaryMary last month about my work, and the interview got featured today on Etsy's blog. You can read all about it on the "Quit your day job" section of their blog. You are my new hero! I found you from an emailing from Etsy's blog. I am about to begin that journey in 2009. Congratulations on your huge success and living your dreams! Your article was my favorite of all the quit your day job series! I really enjoyed reading it and your creations are fabulous! Happy Holidays to you and your family! Look at you, you pretty girl. Congratulations ... you are an inspiration! Read the article! What an inspiring person you are! All the best and Happy Holidays to you and your family! 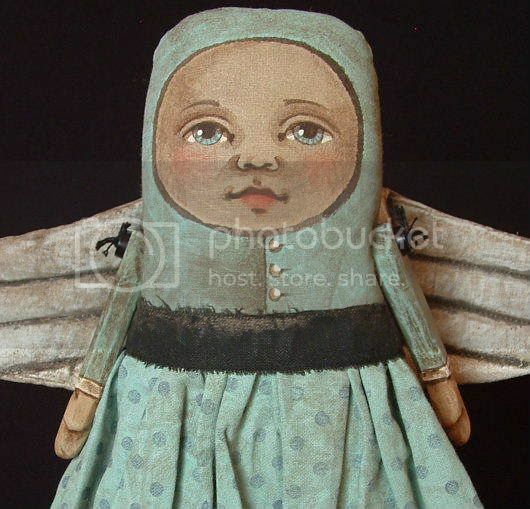 I"m so glad to know more about the beginning of your Etsy career... children are usually reasons for deep changes in our professional life, I know that for sure. Great article! I quit my job 9 years ago to create art for ebay too. It's especially nice because I can raise my nearly 3 year old daughter and work when my husband gets home. I started etsy about a year ago. Hope to sell more there in 2009. I like it much better than ebay. Congratulations. I just stopped by to wish you a Merry Christmas and a Happy New Years...to you and yours. So nice to finally put a face to the art :). You inspire me to hold fast to my dreams...they do come true! Here's to continued success! I'm off to check it out and you look wonderful in that shot, Congratulations! Felicidades! Me alegro mucho por ti!!! Te deseo una FELIZ NAVIDAD en compañia de los que te quieren!! What a lovely interview, I really enjoyed reading it! Yes, I saw it yesterday and I left a comment there. I always like to know more about you. Congrats on the article! I loved it! Wishing you a very Merry Christmas Danita! A very nice article and a nice picture of you to:) Now I know who I am buying from. I wish you much success in 2009 and I know I will be there with you. Have a wonderful time with your family. Felicidades Danita, te deseo que sigas cosechando muchos logros mas. Todo lo que haces es bellizimo. Ay, que linda, Danita... and your artwork too! :-) Congrats on the excellent blog interview. your art and your story are inspiring. may 2009 bring even more blessings. Hello! Found my way here via your interview and just wanted to say Congrats!! Love your work and love reading about artists making their way, their own way. Best of luck for '09. It looks like it will be great for you!! Congratulations Danita!!! I'm so bummed I missed seeing you on Etsy. Have a Happy New Years!!!! i run to read it!! headed over there...congrats, and happy New Year! What a wonderful start to a new year! just read the interview! it was great.